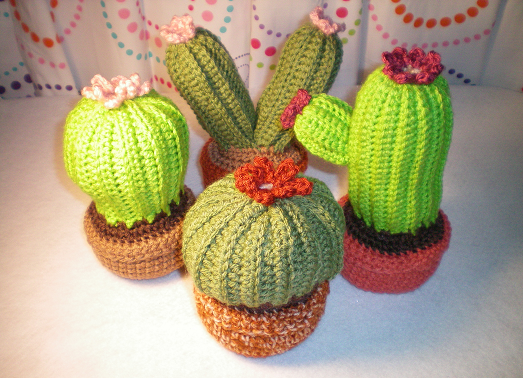 Found this blog by elf luvs dwarfs featuring some super cute crochet cactus. The pattern is worked in rows using the back loops to form the ridges. Genius! Pattern Credit elf luvs dwarf There are a few cute cactus patterns out there. I found Nadia's "How to Crochet a Cactus" on Flickr and became inspired to make a few cacti. I even went so far as to make a pattern for these four cacti! They are really quick and easy to make and stand about 6-8 inches tall. Share your pictures with me if you make one! Materials: Worsted weighted yarn in Green, Clay, Brown, Cream, and Pink Crochet Hook G (4.00mm) Stitch marker Yarn Needle Polyester Fiberfill Finished size approx. 6-8 inches tall Abbreviations: ch = Chain hdc = Half Double Crochet FLO = Front Loops Only sc = Single Crochet sl = Slip Stitch BLO = Back Loops Only dec = Single Crochet 2 Stitches Together Cactus #1 Body: With Green ch 26, turn 1) Sc in 2nd chain from hook in BLO. Sc in BLO across, ch1, turn  2-27) Sc across in BLO, ch1, turn  28) Bring row 1 up matching row 27 to form a tube. Sc across in BLO of row 27 and in empty loops of chains from row 1. Finish off. Sew a long piece of yarn through the loops of the top opening of the cactus and pull to gather closed. Join Brown with sc on any row on open end of cactus. Sc across the bottom of the cactus. Finish off and leave a long tail for sewing. Stuff. Cactus #1 Arm: With Green ch 12, turn 1) Sc in 2nd chain from hook in BLO. Sc in BLO across, ch1, turn  2-17) Sc across in BLO, ch1, turn  18) Bring row 1 up matching row 17 to form a tube. Sc across in BLO of row 17 and in empty loops of chains from row 1. Finish off and leave a long tail. Sew the tail through loops along the top opening and pull to gather closed. Stuff and sew Arm to side of Main cactus wherever you want or use the picture for reference. Cactus #2 Body: With Green ch 16, turn 1) sc in 2nd chain from hook in BLO, hdc in BLO in next 13 stitches, sc in BLO in last stitch, ch1, turn  2-30) sc in BLO in first stitch, hdc in BLO in next 13 stitches, sc in BLO in last stitch, ch1, turn  31) Bring row 1 up matching row 30 to form a tube. Sc, 13 hdc, and sc across in BLO of row 30 and in empty loops of chains from row 1. Finish off. Sew a long piece of yarn through the loops of the top opening of the cactus and pull to gather closed. Join Brown with sc on any row on open end of cactus. Sc across the bottom of the cactus. Finish off and leave a long tail for sewing. Stuff. Cactus #3 Body: With Green ch 21, turn 1) hdc in 2nd chain from hook in BLO. Hdc in next 12 stitches in BLO, sc in next 7 stitches in BLO, ch1, turn  2) sc in next 7 stitches in BLO, hdc in next 13 stitches in BLO, ch1, turn  3) hdc in next 13 stitches BLO, sc in next 7 stitches BLO, ch1, turn  4-27) Repeat rows 2 and 3  28) Bring row 1 up matching row 27 to form a tube. 13 hdc then 7 sc across in BLO of row 27 and in empty loops of chains from row 1. Finish off. Sew a long piece of yarn through the loops of the top opening of the cactus (the hdc side) and pull to gather closed. Join Brown with sc on any row on open end of cactus. Sc across the bottom of the cactus. Finish off and leave a long tail for sewing. Stuff. Cactus #4 Body: (make 2) With Green ch 21, turn 1) sc in 2nd chain from hook in BLO, sc in BLO across, ch1, turn  2-17) sc in BLO across  18) Bring row 1 up matching row 17 to form a tube. Sc across in BLO of row 17 and in empty loops of chains from row 1. Finish off and leave a long tail. Sew the tail through loops along the top opening and pull to gather closed. Hold both Bodies together with the bottoms facing you. Sew the two pieces together on the bottom where they touch. Join Brown with sc on any row on open end of either cactus. Sc across the bottom of the joined cacti. Finish off and leave a long tail for sewing. Stuff. Cactus Pot: Use this pot for all Cactus styles with the variation of dirt indicated as below. Pot is worked in rounds, do not join or turn at the end of rounds. Use a stitch marker to keep track of rounds. With Clay make a ring 1) 8 sc in ring  2) *2sc in same stitch* around  3) *sc, 2sc in same stitch* around  4) *sc 2, 2sc in same stitch* around  5) *sc 3, 2sc in same stitch* around  6) sc around in BLO  7-14) sc around  15) sc around in FLO  16) sc around  Finish off. Leave a long tail. Turn down the last 2 rows of the pot to make the outside rim. Use the long tail to sew the rim down to the pot. Join Brown with sc to any free loop of Round 15. For all Cacti, sc around the free loops of Round 15 . For Cacti 1 & 4 continue to make a second round of dirt by *sc 2, dec* around. Finish off and stuff. Using the long tail of the dirt round from the Cactus Body, sew the dirt round of the Body to the last dirt round of the Pot. Finish off and weave in all ends. Flowers: These flowers can be adjusted to make the number and length of petals you desire. Make 1 for Cacti 2 & 3; make 2 for Cacti 1 & 4. With Cream make a ring; 8 sc in ring, finish off. With Pink join with sl in any sc. *Ch 6, sl in same stitch, sl in next stitch* around, finish off. [8 petals] Sew flower to the top of the Cactus Body or arm.